Last Saturday was our club's first ever tailgate party! And it was so much fun that it had us wondering why hadn't done something like this before. If you were unable to attend, we're sorry that you had to miss out. But we hope to see you at our next event! 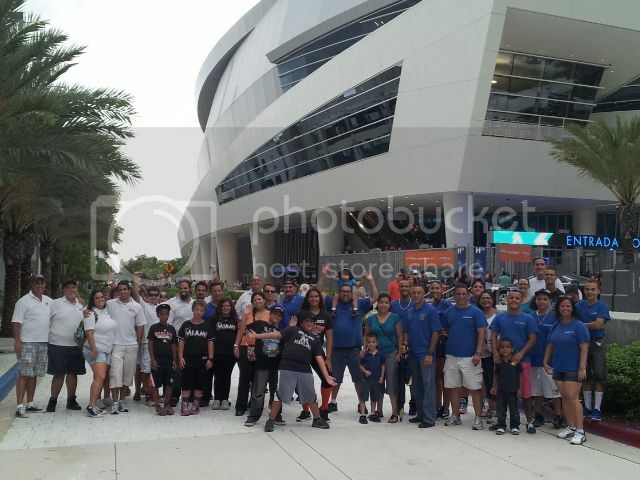 We had lots of vehicles show up to the tailgate party, which was held at the service area of Gus Machado Ford. From there we caravanned to the game. Much to our surprise, a conveniently located open lot awaited the arrival of our Ford-powered team. From there it was a short, brisk walk to the ballpark. Upon entering the stadium we were greeted by live performers dressed in colorful, folkloric Colombian costumes. Evidently, it was Colombian night. Suffice it to say there were lots of photo opportunities and infectiously festive live music that would make wallflowers dance. 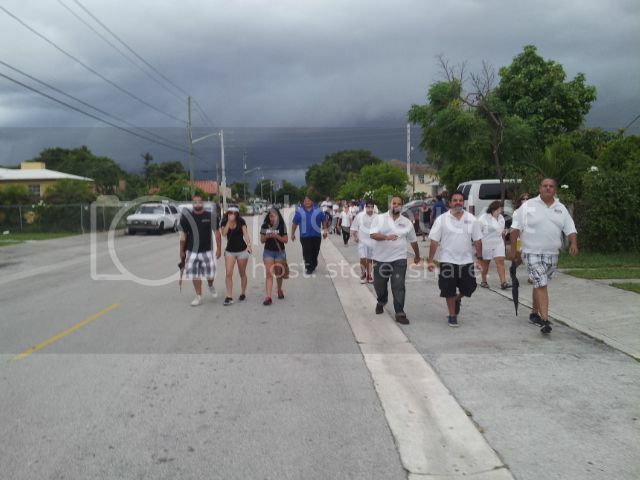 Our infamously uncooperative SoFlo weather actually cooperated with us, as we went into the ball park without rain and left without rain. While inside of the stadium, however, it stormed profusely. No matter. 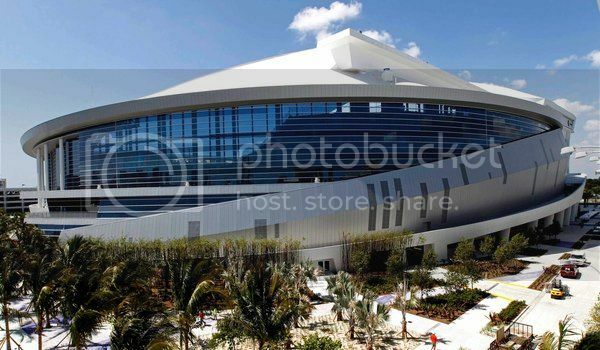 Beneath the protective dome of the new stadium (pictured below), we witnessed the Marlins game undisturbed. And what a game! After falling behind for most of the game, our Marlins somehow managed to score a home-run at the bottom of the 9th and pulled an unexpected comeback victory, bases loaded, in the 10th tie-breaking inning against the Nationals. 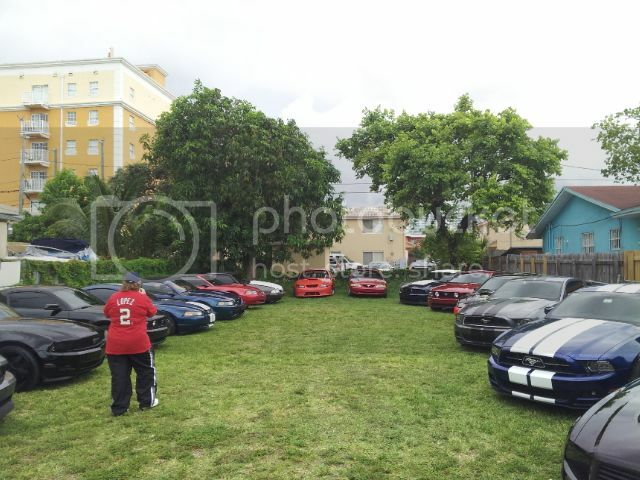 Thank you to South Florida Ford for making this event possible and to our sister-club, the Muscle-Stangs of Miami, for joining us and letting the good times roll as always.